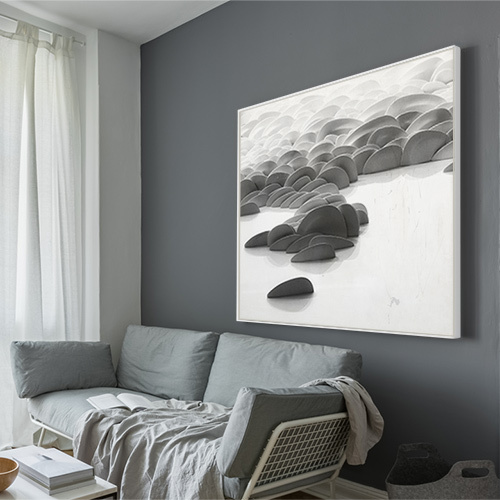 With a smooth, satiny white finish, this picture frame has an extra deep rabbet to float and show off the outside edges of your modern canvas art up to 1 5/8”. Made from natural wood in the USA, it comes with everything you need for easy DIY hanging. How Do I Measure? Canvas can warp slightly, so measure at the corners for accurate sizing. I liked it so much that I ordered it again. I highly recommend it. This item arrived and the color and quality was good but the dimensions were off in that one side was wider than the other. I tried to hide this by putting the crack at the top so that you can't tell but I'm disappointed overall. We apologize for the condition the frame arrived in. Would you please allow us to replace the frame for you? If you don't mind, please send us photos of the frame to: customercare@pictureframes.com. Attention- Shea. I will be glad to send you with a frame that delivers the excellent quality we strive to present. I ordered a 24 X 30 in white frame but when I put the canvas in the floater it was made too large. This is the second large floater and I had the same exact problem with the other frame as well. 1/2 in around three sides and 3/4 in on the fourth. I put them together , took them apart to adjust it so it was more even and then put it together again, but they were never perfect. Will send them back the next time. Marilyn thank you for your feedback. That is very unfortunate that you experienced the sizing issues. Typically we only add 1/8" allowance to the width and height of our frames to allow for the canvas to fit inside the frame. In your case it seems that this was not done correctly. If you could please give us a call, we are happy to send you a replacement frame cut to the correct size. Thank you for your feedback. Had problem assembling frame. People couldn't help. Solution was simple. I went online and found the way to assemble it. Picture Frames printed directions were not clear. It was easy with online visual directions. Thank you for your valuable feedback Warren. We regret that you had issues assembling the frame. Our Customer Care Team will typically walk you through the assembling process. We are thankful that you found a resolution online by watching the videos. We will look into improving the clarity of our assembling directions. If you have any questions, please give us a call at 1-800-332-8884. UPDATE: We have since updated our instructions and hope they are more clear and easier to follow. I just had a sold out show here in Los Angeles. The frames made my work look so complete and finished. The frames are packed extremely well and all the hardware is included. I recommend their frames to all of my commission clientele when I ship work all of the US. Great Job! Nine 26x26 inch CFL9 frames in white in a 3x3 grid. This frame is my favorite and works very well with my artwork. Pictureframes.com is a professional company. Once they sent me a faulty frame. I called them back and they quickly replaced it. 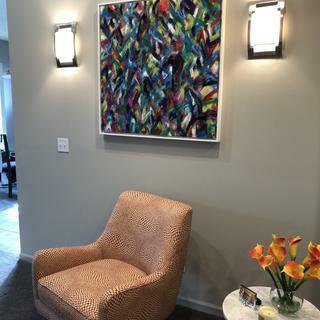 Soft modern for smaller canvases. This frame is best for smaller framing projects. For my 24x36 canvas it was warped and thin. The surface color was very attractive, however but needs to be measured tight. There is no room for error. Very modern and just enough softness. Hello Ann. We appreciate you taking time to submit your review. We apologize that the frame arrived warped. If the frame needs to be replaced, please give us a call at 1-800-332-8884. We are happy to make this right with you. 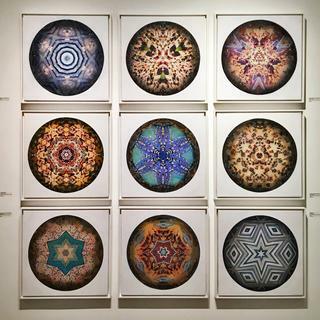 These frames are perfect for the modern art I create. I've sold several art pieces and all my clients comment on the great look of these frames. I highly recommend this company. Quality products with great customer service. I was worry about buying a frame on line, but thanks I found this company. They have an easy way to choose what you need and have a great variety. I’m sure I going to continue ordering from you. Great quality and exactly what I was looking for - but instructions are VERY poorly written and there is no one to help on weekends. I'd suggest adding actual photos of hardware installed vs drawings - would be way easier to understand! Hello Karen. We appreciate your feedback. We apologize for any inconvenience. Perhaps we can add the clickable links to our instructional videos to our website. We have videos that show you step by step how to install the canvas inside the Floater Frames. Again, we appreciate your feedback and I will pass your feedback along to make improvements to our paper instructions. Have a wonderful day. I order the white and then spray paint it to the color I need, and the results are absolutely gorgeous! I spray painted my white canvas floater purple to pair perfectly with my purple background.Love it! I ordered this frame in two different sizes 30x40 and 10x30. Both fit as expected - I'm pleased with the results. Product arrived very quickly. Construction was not put together very well. There is a gap in one corner joint along with chipping of paint. One side of frame also has chipping. Difficult to see the side chipping from a distance but why even send out with the chipping. The gap in the corner joint is very visible. Hello Richard. Thank you for placing your most recent order. We regret that the frame arrived damaged. We really appreciate you taking the time to email us photos of the frame. I assure you we have quality control checks that would not allow the frame to leave in that condition. As a way to make this right with you, we are sending a free replacement frame. I left you a voicemail with all the details regarding the replacement frame. If you need anything else, please let us know. Have a great day! You guys did a great job packing the frames... which makes me wonder how the corners of 3 out of the 4 frames arrived chipped. Corners were not glued very well either. I had to take the one good frame to get the corners filled and glued. Hi Debra! Thank you for alerting us to this issue with your order. We sincerely apologize the frames arrived in that condition. We would be more than happy to issue replacements for the frames that were chipped. If you could please contact us at 800-332-8884, to verify the sizes, we can have that order processed as soon as possible. Great frame. Perfect fit for my new Jo Hay oil painting, and shipped quick. Love finding the pictureframes website. 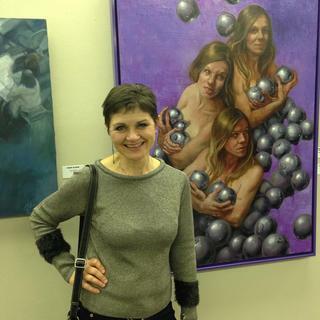 For years I have been buying the deep canvases and thought they could stand on their own. After buying a few of the CFL9 floating frames I confess they add to the paintings. The large frame arrived damaged through shipping but was immediately replaced with no problems. I'm very happy with the quality and quick arrival. I've now got four of their frames hanging. GREAT QUALITY product, perfect fit, and very affordable. My frame came on time, and was exactly what I expected! GREAT QUALITY, perfect fit, exactly as expected! My very large stretched canvas really needed a finished look. This frame was so easy to put on my painting. It now looks the way it should! Beautiful! Fits perfect, arrived quickly, great frame. Will definitely order again. This is an excellent cost effective way to give your finished work a custom framing look. I love the simplicity and the clean lines. The frames are well constructed with a clean finish. Intructions clear and simple. Love these frames! Love the service. The frame fit my work perfectly and really helped to put on the finishing touches. The ease of ordering, affordable pricing, and the fast delivery time makes this a great option for "starving artists"! My only issue is that the finish on the frame scratches so easily. Although I haven't done so as yet, I hope touching up is possible. I must commend the great customer service too! I really like the frame and would recommend it to others. It is good quality and sets off the canvas nicely. It arrived in one piece/no assembly (of the frame) required. I finally found a frame to fit my art projects ! Either my canvas paintings or my canvas photography projects now look finished and ready to hang on the wall ! Quality was great as well as the fit ! Nice, clean-looking frame. Works well with canvas paintings. The frames arrived in perfect condition. They were wrapped in bubble wrap with great care. Fit the pictures perfectly. Look great. This is a very nice looking frame. I am very pleased with the quality and finish . Directions could be better but overall good quality frame. Great fit and a great price. Will definitely use this site again. Perfect frame for my painting. Great quality and easy purchase. I will definitely be order more! Great product and right in time! I am familiar with framing and was pleased with the quality and ease of the product. I have been looking for quality floater frames at a good price point, and this is it! I have purchased several in the last 2 months for both 1 1/2" and 3/4" canvases. They are great quality at a great price, and they arrive very quickly. I would definitely recommend these to anyone looking for a floater frame. This frame was the right choice. It is complimentary to the white on the canvas; more creamy than bright white! It is not overstated but does a great job of making the colors pop. The frame I would buy again; not so happy with the wait to get the replacement mounting hardware or the quality control of the hardware packaging. I love this frame, but the hardware provided did not have enough screws. Hello Lorraine! Thank you for your review. We apologize you did not receive enough screws in your hardware packet. We can certainly get a new hardware packet out to you. Please give our customer care team a call at 1-800-332-8884 so that we may set this up for you. We appreciate your business and look forward to serving you again! Escalated my art to the next level. Well made well packaged and quick ship! 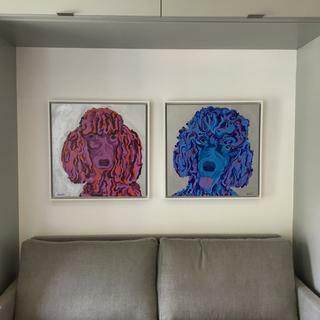 These frames are well made and look great against my grey walls! I am very happy with my purchase! Great quality for a great price! Definitely will purchase again! This is a RICH looking, sturdy frame. Took my canvas print to a higher level. Extremely pleased. Easy to attach picture. This frame is a high quality material. The frame is a nice weight and size and came with clear instructions for installing my painting. I ordered a white wood frame and it is perfect! Was hard to find a website that did the custom size we wanted in a floating frame. We love how easy it was to order, got a reasonable price, and the shipping container was a fortress. Definitely recommend! We loved this picture but it blended in with the wall. This frame gave it the perfect pop! This frame is perfect for that extra thick canvas. It arrived within a week -- really quick. The frame arrived already assembled, all you have to do is screw 4 screws in the back to secure the canvas with the clips in the frame -- easily done in 2 minutes. The frame really sets the painting off beautifully and gives it a great "finished" look. 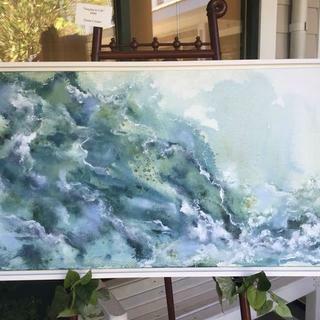 And the price was really reasonable -- if would have been at least 3-4 times the cost if I had taken it to a local framer. So pleased with my choice! Great quality and value! I am very happy and will be a repeat customer for sure. These frames totally enhance a painting without overpowering it! This is called "Surging to Life" and actually made one visitor start to cry --she was so moved. I had been looking for a float frame and this one fits the bill perfectly. It was exactly what I wanted. Only negatives: The instructions were hard to understand though the online video was helpful. Also, it would have been VERY helpful to show what canvas depths will work with each frame. I used the 1 5/8" frame for my 1 1/4" canvas and it was fine, but required calling customer service. It would have been nice to have that information available online for a much quicker purchase. Hello Alan! Thank you so much for your valuable feedback. We have instructional videos available upon request that gives a visual guidance on how to attach the canvas to the frame. Thank you for calling in so that we could give you more guidance over the phone. We are working on making the videos more accessible on our website. In the meantime, please continue to give us a call if you have any concerns. Thank you again for your business! Great quality! 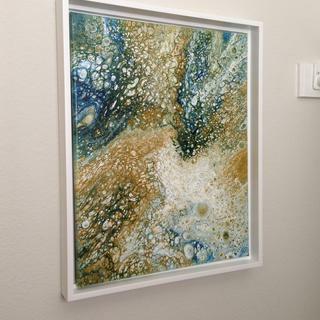 The frame was the perfect touch to an original abstract painting. Great floating frame at a great price. 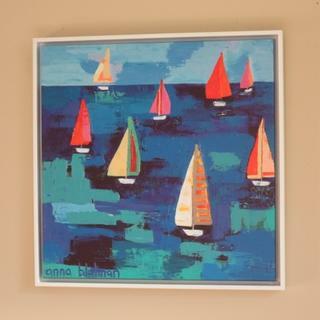 Easy to put canvas into assembled frame and secure to the frame. All the parts are taped to the frame and neatly packaged. I have since ordered another floating frame for other artwork. This is my first time buying this floater in white. I wanted a sleek, simple, contemporary look and this frame will provide that. I like that it isn’t heavy and doesn’t add too much to the size of the canvas. complements the canvas. clean and modern. Always gives my work an irresistible finish. goes well with a highly vibrant and colorful canvas. First time purchase of this frame. Looking for a white minimal floater. Hope it does the trick. I do not want to cover the sides of the canvas panel paintings. I like the clean edges and simplicity. I bought one other and I like the look. My daughter bought me a beautiful canvass print of Elvis Presley which I wanted to get framed. I went to a couple of stores to see about having it done, or doing myself. Estimates were $100-!60. The frame price was great; not too happy with the shipping cost. I'm hoping it will be easy and my picture turn out very nice. If it does, it's worth the $61. EXCELLENT QUALITY, EASY ASSEMBLY, GREAT PRICE. have just received my previous order of 2 black canvas frames and they worked out beautifully! Matches the woodwork in the kitchen where the print will be placed. We've framed old paintings from our days at art school in these frames and they look amazing. Simple to put together and lets the canvas be a physical object. Nice presentation. I picked this frame for my canvas painting. 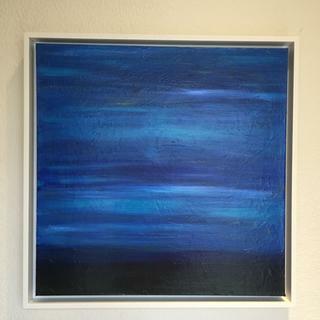 It's an abstract art with blue tones and I think white frame will make this painting stand out. 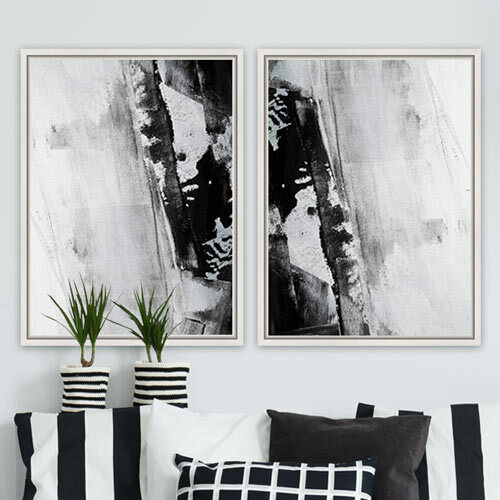 Floater frames work well with canvas prints and white is clean and pretty without taking away from the art itself. Wanted a white floating frame, Derek said this was the most appropriate to get. I think it will look good with my modern abstract painting in shades of light pink. Wanted a clean simple non-distracting frame for a contemporary painting with a complex surface. Art is very colorful and dark with small white accents. Perfect for paintings on canvas with images extending to the very edge, because none of the image is covered by the frame. I wanted a summery, thin frame for a beach scene. I think it will work for a bas relief. I hope so. I've chosen this floater frame in the past in silver, black and now white. The turnaround is quick and they arrive ready to frame, complete with hardware. It suits my abstract paintings on wrapped edge canvas and the price is right. I was thrilled with my first order, so I'm ordering a couple more. This will be my first white frame for a contemporary gallery wrapped canvas. for oil painting on canvas. It fits two canvas pictures that I purchased without frames. 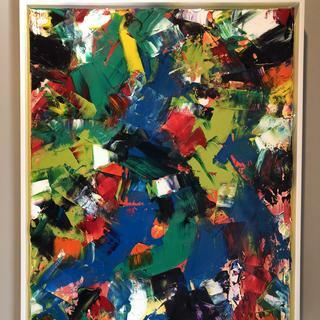 My painting is a rich turquoise and the white frame should help the color pop. 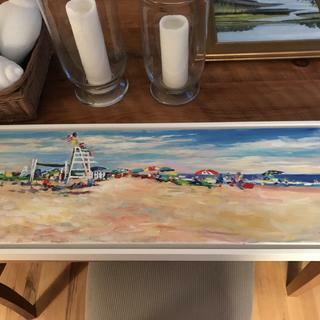 I do a lot of beach scenes and the white frames are perfect. Simple and looks good on any canvas. 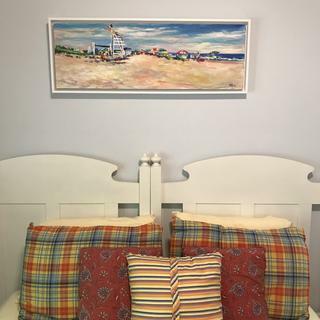 Great frame to show off a seascape with white cliffs. Frame enhances the art and doesn't overpower. Floater frames are my favorite and this one looks perfect. I think it will look great on my new canvas painting. floater frames show of my art. This frame works very well with my artwork. The thickness of my canvas is 3/4 " ...will this work? BEST ANSWER: This frame is too deep for your canvas. You will need to go with the CFS9. The profile is the same, and the depth is 11/16". My canvas is gallery wrapped 30" x 30" 1-3/8". What size frame should I get ? BEST ANSWER: Hello Stephanie! Please order the frame to be the exact size of your artwork, 30"x30". The depth of this gorgeous frame is 1 5/8" which will work just fine with your canvas. Happy Framing! I paint on paper and the jury panel/gallery for my upcoming solo show is requiring I use floating frames (knowing I paint on paper). Will these work without additional mounting? BEST ANSWER: Not sure how that would work. 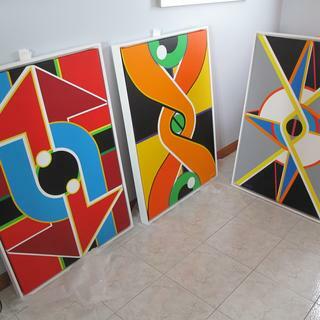 I've only used these frames for gallery-wrapped canvases. The mounting hardware for the frame then is screwed into the back of the canvas stretcher. If your paintings are under glass, you'd need something to hold the work in because there's no lip on this floater frame. I don’t think so...Maybe try some illustration board. You could cut them to size and possibly glue them in or get some clay board. Both surfaces are much like paper and could possibly work for you. Hi, I’m not familiar with jury panel so I’m not sure what the weight is. If it’s regular watercolor paper you will have to mount it on a sturdier backing. It will not. 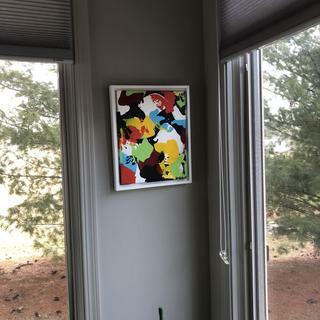 You would have to mount the paper to something in order to make this frame work. No. These will only work for canvas or mounted panel. My canvas print is 50 5/8" by 23", and the edges that will fold over the sides are 2" deep. Do I include those 2" in my measurements when placing the order? I.e., should I order 52 5/8" by 25" or leave out the 2"? 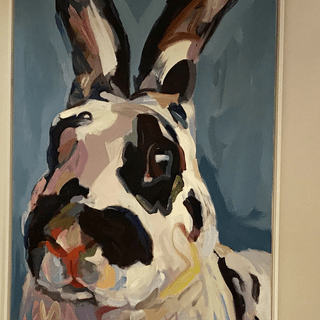 BEST ANSWER: If I understand correctly what you're asking, the answer is No, but stretch your canvas first over the stretchers and then measure the final product before ordering the frame for it. The floater is a cradle for an already stretched canvas, not a way to stretch the canvas. To further clarify what you need to do and what you need to order though, call customer service…I'm just another customer, so what I say can't be backed with any kind of guarantee. if you order the wrong size and say…"But Judy said…! "…they'll say, "Who's Judy?" Enjoy the frame though, I love em! I am not sure I understand your question, but I will try to describe the frame and with that you might be able to make a decision. 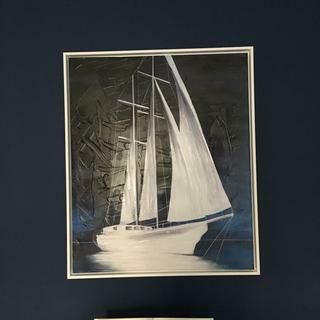 Think of the frame as the inside of a box and your canvas as another box that you are going to put into this frame-box. The canvas' base, its footprint, sits on the bottom of the frame-box. The size of the base of the canvas-box is the size that you order as your frame size. You measure the base dimensions (L x W) of your canvas. For the depth of your canvas you need to choose the right frame, one that is large enough to frame its sides. When ordering for your canvas you will order by the outside width and height of the frame only, in your case the 50 5/8" by 23". The 2" depth of your canvas will relate to the rabbet depth of the frame you order. This frame is 1 1/2" deep so 1/2" would protrude from the front of the canvas floater frame. You will not need to add in the depth to your outside canvas dimensions. the canvas will fit into the float frame. Order the size that the actually stretched canvas size. You only give them length and width, not depth of the artwork. will this frame work for a mirror? BEST ANSWER: It will depend on how you fasten the mirror to the frame. You need to attach what you put into the frame, from the back and this requires a piece of hardware (included) that is shaped such that one end is screwed into the frame back and the other is screwed into the back of whatever panel you are framing. You cannot set a screw directly into the back of the mirror, but if you had a piece of wood glued to the back of the mirror, then you could attach the screw to this wood and because it is glued to the mirror it would hold it in place. Your glue would need to be strong enough to support the weight of the mirror. It can be done, but not without a bit of adaptation. It should be. Depending on your creativity. You might have to glue the mirror to a board (e..g 1/4 or 3/8 thick - wood board) then secure / attach it to the frame in the back with crews/clips. I think it would. You would probably have to use points to hold it in place. This frame is for canvas only. Thank you! 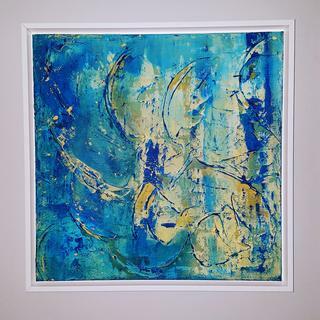 I have a 6x6" painting that was done on wood, it also has 1"wood around the outside of the painting to kind of mount it. I want to put a border around it and frame so it's bigger by 2 to 4 inches. Thanks for the advise! I thought a floating frame would work perhaps? BEST ANSWER: The floater frame always looks great and clean, and does add about 3/4" an inch to the outside perimeter of the painting. The frame itself is 2" thick, with a 1 1/2" rabbet for the art to sit inside, so I think it sounds like your painting would be 1/2" shorter sitting inside the frame. 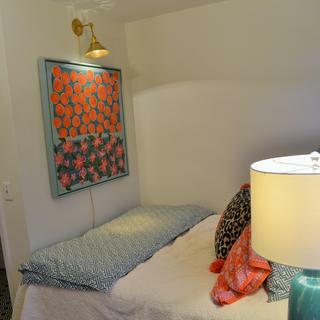 A floating frame may work for you. 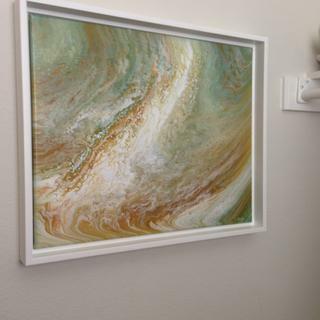 It may be helpful to email a photo of your art so that we can best advise you as to if a floater frame will work. This frame will add 1" to each side, so will provide your "2-4" requirement for enlargement, so should work. I have a painting that measures 82.68 inches wide x 31.5 inches height x 1.57 inches deep (210cm x 80cm x 4cm). The painting is in 7 separate sections. Can I place this in this particular floating frame? Would I be able to mount all 7 sections? BEST ANSWER: This sounds like a really interesting piece and presentation. I think it may be best to frame each canvas individually and hang them together on the wall. With out knowing more details that is my recommendation. Please give us a call or chat with us to see if we can make this work for you. 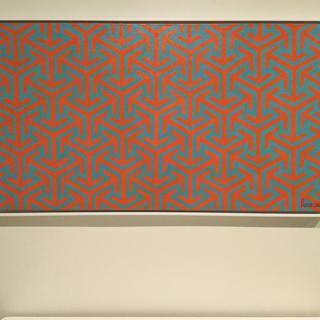 BEST ANSWER: Hi Miglena, The frame you are looking at can fit a canvas with a depth of 1.5". 4 cm is 1 37/64" meaning the canvas would sit a little bit above the frame. I recommend ordering a free 3" sample to see how your canvas would sit in the frame before making a purchase so that you can get the perfect look. If you have any additional questions do not hesitate to contact our friendly framing experts at 1-800-332-8884 or via LIVE chat Monday-Friday.Happy Framing! you should order 48 x 48". Hello, I'd like to frame a series of small paintings created on 2" deep cradled panels but the paintings only measure 4" wide (less than your minimum option.) 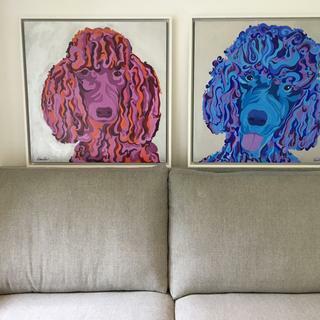 Would it be possible to request a quote that would accommodate these 4"x6" paintings? BEST ANSWER: Hi Tamara. Thank you for reaching out to us! Due to safety concerns, we are unable to make anything less that 5". 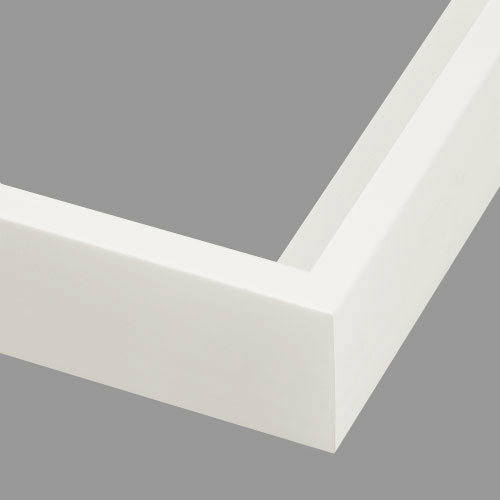 Our floater frame also only hold up to 1 1/2", therefore, the 2" would stick out from the frame. Our framing experts can help answer any questions that you may have. They are available at 1-800-332-8884. Thank you! 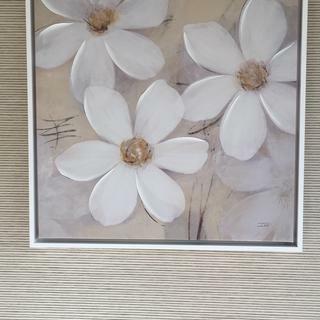 I have a canvas picture 36” x 29/12” What size floating frame should I get? Thank you for your inquiry. 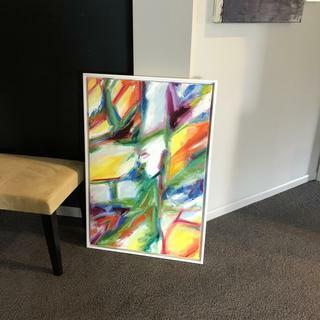 You should be purchasing a frame that is the size of your artwork. We have a helpful video that shows you how to measure your artwork as well as explains frame components. Check it out here: https://www.youtube.com/watch?v=i7wk0gGzMT4. If you have any more questions do not hesitate to contact our friendly framing experts at 1-800-332-8884. Is the interior of the white frame (CFL9) black? BEST ANSWER: Hello Linda! The interior of the frame is the same white color as the face and sides of the frame. Thank you for your inquiry! I have an antique Telephone booth sign that is glass and I want to protect it - size is 25 1/2" w x 5 1/2" h. Which frame would be the best? BEST ANSWER: Hello Becky. Any of our Custom Frames will work with your antique Telephone booth sign. Please search under Custom Frames and select the color/style frame that appeals to you. Then enter the size exactly as 25 1/2"x 5 1/2". Thank you for your inquiry! 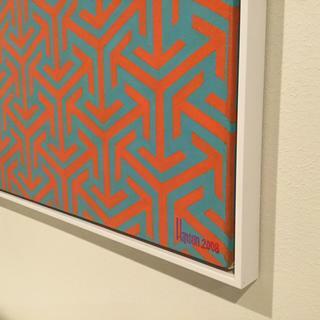 Do you have this frame but with a backing? BEST ANSWER: Hello! These beautiful frames are designed to support canvas and do NOT come with backing. Please let us know if you need more assistance. Happy Framing! 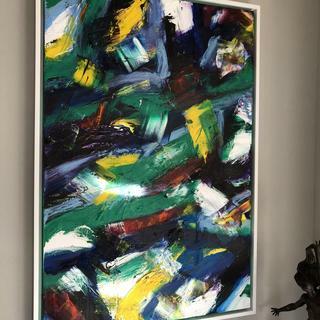 I own a painting that is 48” x 48” in size. Can I have a box frame made with these dimensions, and sent to my home? BEST ANSWER: Hello! We can absolutely cut the frame to size 48"x48". This particular frame is used exclusively for canvas. Please give us a call so we can guide you to the perfect frame. We can be reached at 1-800-332-8884. Happy Framing! Quick question- instructions are clear for attaching brackets. Just doesn't say where to place them. Corners? BEST ANSWER: Hello. We suggest placing the assembling brackets about 1/3 down from the corners of the frames. Please see the video link attached. If you have any additional questions, please let us know. For sizing purposes my piece is 29 3/4 x 23 3/4. Do you want that exact measurement or standard size of 30 x 24? Are frames returnable? BEST ANSWER: Hello Sarah! Thank you for your inquiry. Please enter the exact size of your artwork, 29 3/4"x 23 3/4". We have a 45 day return policy and we will provide a return label if you need to send the frame back. If you have any additional questions, please let us know. Happy Framing! 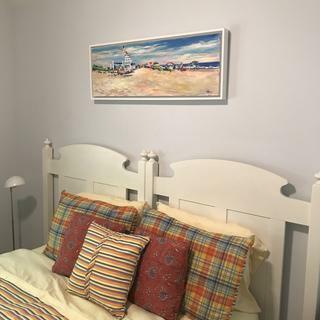 Do these floater frames accommodate artwork that has a depth of 1 1/2"? BEST ANSWER: Hello Sarah! Thank you for reaching out to us! Yes, the Floater Frame will work. The Floater Frames is 1 5/8" deep which is compatible with your 1 1/2" deep canvas. If you have any additional questions, please let us know. Happy Framing! My canvass is 24 X 30 with a 1 1/2 profile. What size frame should I get? BEST ANSWER: Hello Barbara! Thank you for your inquiry. Please order frame size 24"x30". The depth/rabbet of the frame is 1 5/8" which will work just fine with your 1 1/2" deep canvas. Have a great day!